1. Construct a regular octagon given the length a of one of its sides. 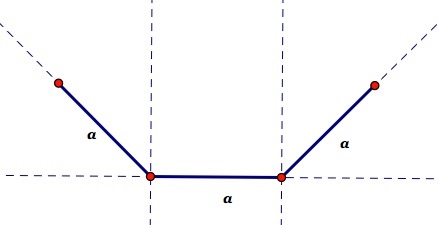 Hint: Constuct a right angle on each end of the segment of lenght a. Bisect each right angle external to the segment. Mark off lenth of two more sides of the the octagon. Continue . . . This uses the property that the external angles of a regular octagan are each 45 degrees. 2. 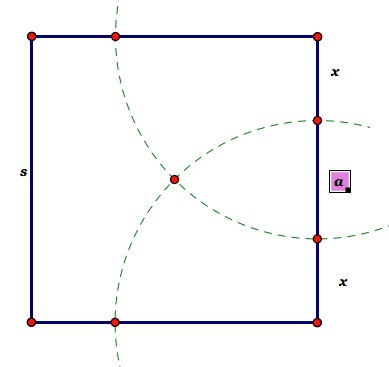 Construct a regular octagon from a square of side length s.
Construct, rather than measure. The distance from each vertex is a + x, where a is the length of the side of the octagon and x is the length of the leg of the isosceles right triangle that is "cut off" of each corner of the square, but x + a is half of the diagonal of the square. 3. 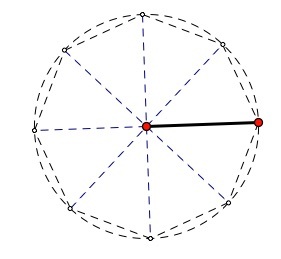 Construct a regular octagon given the distance from the center to a vertex of the octagon (i.e. 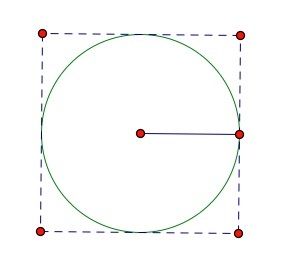 the radius of the circumscribed circle). Construct, not measure. Diagonals of the octagon would be separated by (constructable) angles of 45 degrees. Etc. 4. Construct a regular octagon given the perpendicular distance from one side of the octagon to the opposite (i.e. twice the radius of the inscribed circle). Build a square around the circle and construct the octagon from that. 5. What is the length of the Apothem of a regular octagon with side of length a. 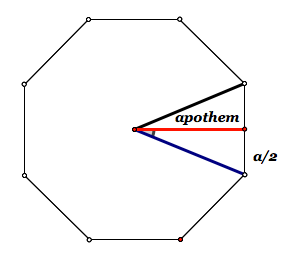 The perpendicular distance from the center of a polygon to one of its sides is the Apothem. The "slice" of one-eighth of the octagon is an isosceles triangle with base of length a and height of the Apothem. The central angle is 45 degrees. Set up a right triangle and use the tangent function. 6. What is the area of a regular octagon with a side of length a? b. The area formed by the sum of eight isosceles triangles triangles with common central angle at the center of the octagon. 7. What is the length R of the radius of the circumscribed circle? 9. Suppose you were planning to construct a Gazebo with a foundation that is a regular Octagon. 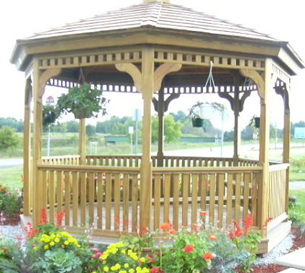 Octagonal gazebo plans come sizes of 6 feet to 30 feet. Usually a web site for gazebo plans will give no indication of what the size measure is about. ASSUME it is the radius of the inscribed circle; in other words it is the width from one side of the octagon to its opposite. a. For a gazebo on size N feet, find its floor area A sq ft, and the length of a side s ft.
b. What size gazebo would to chose in order to have a minimum of 120 square feet of floor area? What length side would it have? c. Suppose you wanted a gazebo with 200 square feet of floor area. What would be the length of each side? Note: The Gazebo link is to GazeboCreations.com. The picture is NOT one of their gazebos. The picture is a public domain item from the U.S. Government archives.